Can a 12-year old lad who wishes he were a girl navigate the mean streets of Manila? Maxi cooks, cleans, and sews for his father and older brothers who are petty criminals. He's sweet, clever and hardworking, at ease with being gay, pinning a flower in his hair, swinging his hips when he walks, vamping with friends. He's seen adults hug and kiss and he's watched romantic movies, so on the verge of puberty, he develops a crush on Victor, a kindly young cop. Maxi's heart and loyalties are on a collision course: Victor is investigating crimes that lead him to Maxi's family. In the land of the morning, is there a place for this child of the sun returning? 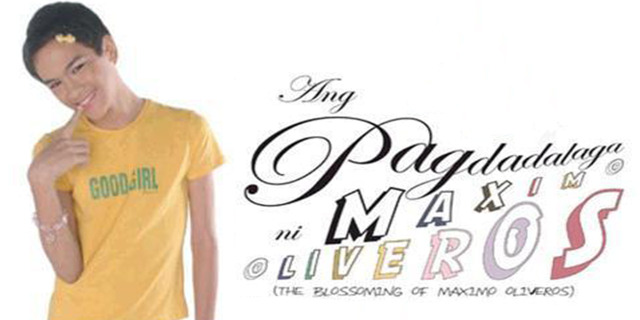 The Blossoming of Maximo Oliveros is a 2005 Filipino coming-of-age film about a gay teen who is torn between his love for a young cop and his loyalty to his family. The film competed under 1st Cinemalaya Film Festival in 2005. The film was the official entry of the Philippines to the 79th Academy Awards. It is one of the few digital films released in 2005 to do well at the tills. It also made the rounds of international film festivals.